Welcome to my new design! Isn’t it just gorgeous? I’ve discovered throughout the design process that I’m a very particular person, so the first shout-out goes to Benji Greig who gently explained to me that turning “pages” had been done to death then proceeded to make me a website I love to bits. I’ve been writing this blog for a couple of years now. Even though sometimes it feels like an endless sucking black hole (or as special k put it – like keeping a plant alive that’s being eaten by bugs), it’s become something I don’t think I could do without. I’ve kept a journal since I was twelve, but I noticed an interesting thing in the past few years: I no longer have boy troubles to tell my journal, or friend dramas. There’s no, “But do I love him, diary?” to sort through, no poisonous fallings-out, or tearful reunions days later. Instead the things that consume me seem to relate to my writing, my future, my career. Adult things? It does feel like a marker of adulthood. I find these days that writing about the questions that consume me serves the same function writing in my journal once did. Which isn’t to say you’re reading my journal now – that would just be icky. The wonderful thing about a blog is that it’s more conversation than soliloquy. This design’s been in the works for a while, but given the recent sale of My Lady Untamed it just feels like the cherry on top – or like rushing into the future, which is nothing like a cherry. Either way, it’s something I want to celebrate with you all! And I thought, What better way to celebrate than to expand the conversation? I sent the first invitation to KA Mitchell and kept saying aloud, “I can’t believe I’m doing this.” There may have been some manic laughter also. And from the posts I’ve received so far, this is going to be a really amazing couple of weeks. As the posts go up, I’ll link them to the names here so that it becomes a kind of directory. There will also be prizes. Prizes! Every time you comment you get a name in a hat (there will be an actual hat), and at the end of every week special k will pick a winner. The prize is a hand-made e-reader cover, with this design on the front <— and the rest of the materials picked out by me to be eclectic and/or elegant and/or funky depending on my mood. Vassiliki had the genius idea of a Duke of Darlington paper dress-up doll – with a spectacular wardrobe, of course. I’ve run out of time to make it this year, but it’s in the works for next year. So very in the works. 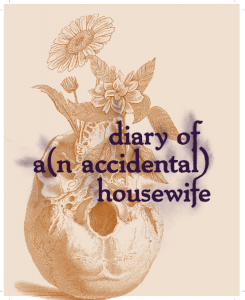 I’ve moved the accidental housewife to a new host, which means that all the subscriptions have been cancelled. If you want to subscribe by email, click the “follow” button on the bottom right of the screen and enter your email. If you have a wordpress blog you can subscribe the usual way. I would like to thank all the people who were subscribed to the previous incarnation of the accidental housewife. It’s been so great sharing the journey with you from aspiring (rambly) writer to whatever I am today. So this is me, officially declaring the festivities open! That’s an impressive list! Looking forward to reading the posts. I love the simplicity of the new design, although I miss the large, sans serif font. For some reason, my screen doesn’t render this new font very well and it comes up a little fuzzy looking,. Thanks Kat! The font is a bit harder for me to read as well… I may just increase the size by a point or two – I think that will help! This design is wonderfully elegant. I love it. I also love your visiting bloggers list and just as I enjoy your lovely, dark and deep posts I am looking forward to hearing these other voices too. Congratulations on all the things you have been working for coming into being. Thanks Merrian! The variety (and knowledge!) in these posts is going to be excellent. Very pretty, and what a lovely list! For what it’s worth, Google Reader still seems to be finding you in your new home (I tried to subscribe to this site and was told I already had it…) – I’ll keep an eye out, though, and if I notice you’ve gone uncharacteristically quiet, I will re-subscribe! Catherine, keeping my fingers crossed that your host transfer is as non-stressful as possible! Thank you :-). Good news about google reader – hopefully because the URL is the same there won’t be any difficulties. This is my first ever host transfer, so many many fingers crossed. Absolutely gorgeous design! And Very Impressive list! Simple and stylish Anna. Love it and looking fwd to your posts. Lovely new home for you, Anna. Very nice, though maybe that vase at the top and on the right is a little unconventional? I mean, a skull? ;-P You always manage to produce thought-provoking articles, and it looks like it will continue with that amazing line up of guests. Yes, they’re WRITERS and, remember, so are you! Thanks Serena – it does feel a bit like a home! And I think a little unconventional suits me down to the ground :-). I’m trying to get my head around being these writers’ colleague soon. It’s sinking in bit by bit, but I assume it’ll take a while. Your website is gorgeous. And I’m agog at guests you have lined up. Girl, you are seriously connected! Thanks! What I am is a pushy bisom ;-). The internet makes some pretty amazing dialogue possible! The design is great and I love the lineup but my eyes are straining to read the text. It’s a little too faint and blurry. The text is the one thing I’m still thinking about changing. I thought I’d just sit with it for a week or two first, but I’ll probably darker and/or enlarge it. Thanks for the feedback, and I’m glad you like the design :-). The design doesn’t actually work all that well for me. It’s probably because I have a small screen, but when I first arrive at a page all I can see are the sections at the far right. Once I scroll down (as far down as the end of the two columns beneath “books” “recently” and “about”) I finally get to see the title of the post, at the left, followed by the text of the post itself. Thanks for the feedback, Laura! The site’s collapsible, so as you widen or narrow your screen you see a different set-up. What you’re seeing is what you also see on a mobile. I might get the designer to change it so that you navigate straight to the blog heading and then can scroll back up, if you want the other links. As I don’t see the site in all different browsers, I really appreciate you letting me know.